A lot has changed since I kicked off this blog a little over a year ago. There’s been a lot of pain, and a lot of bumpy roads, but when I step back…most everything has eventually come out for the best. And so to mark that, and to mark this blog’s first anniversary, and to thank you, my readers, for your comments, for your support through some of the rough patches I shared here…I’ve decided to host a giveaway. When the giveaway wraps up on November 8th, I’ll be giving away two kits to two lucky winners. And not repops of ancient molds bought on clearance at Hobby Lobby. I’m talking some genuinely awesome (at least to me) kits. The first winner will get their choice – aircraft or armor. And the second winner will get whichever one is left. So if the first winner chooses the plane, the second will get the tank. Or SPG or whatnot. 2 – Prizes determined by you! This is where the fun comes in. Instead of just saying “here are the two kits”, I’m going to let you, the readers, vote for which kits the winners will receive! Over the past few weeks I’ve been revealing the kits two at a time. It’s been a lot of fun, actually, kind of like putting together a mix tape, only of styrene. Voting will run through the week, and I’ll shut the polls down on November 8th, at which point I’ll also be determining the giveaway winners. You’re going to be limited to one vote per category, so…choose wisely! To enter yourself into the giveaway, post a comment below that discusses your single, absolute favorite build, and why. What makes it stand above the others? 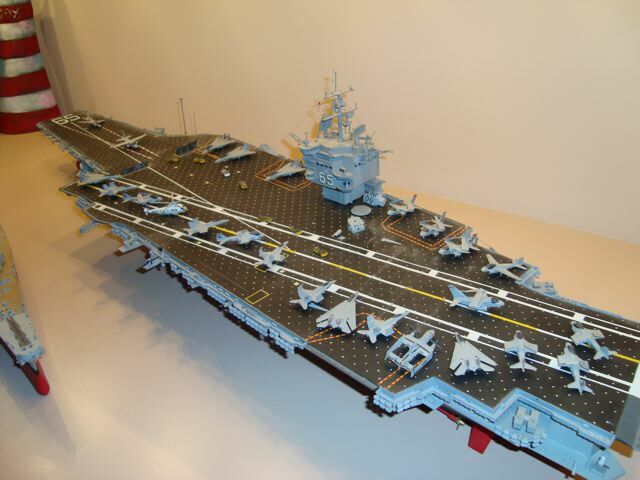 My favorite build was Tamiya’s 1/350 CVN-65 USS Enterprise. I built this monster of a kit when I was 12 or 13. Looking back now, I find I can’t really remember most of my childhood builds. Maybe a flash here or there, no more. But the Enterprise is different. I won’t say I remember it in exacting detail, but I do remember it vividly. I think probably because it terrified me! This was the kit, I think, that marked my transition from slapping plastic together to actually building models. I remember masking, and remasking, and remasking the waterline. Dotting the tie downs on the flight deck with a white paint pen. Building all those friggin’ planes. It was one of the first kits I built where I came away with a real sense of pride and accomplishment…and I guess that shows in how well I remember it. NOTE – You MUST tell your favorite build story in the comments in order to be entered into the giveaway. And if you don’t plan on sticking around, I will need some way to contact you, so make sure the e-mail you use to comment with is valid and checked! The polls are below…go ahead and vote, and then comment to enter. I look very forward to reading the comments and watching the kit “horse race” over the next week. And thank you to all who participate! I just got back into the hobby earlier this year, and as someone who was still very simplistic in their modeling I have found your blog to be a tremendous resource. I have been thinking about my favorite build for some time now (ever since you announced your giveaway) and have unequivocally decided that it is the current build I am working on. It has been my favorite build for many reasons, but most importantly because of the reason I am building this kit. My father in law and I are big WWII buffs; so when he started taking an interest in my re-found hobby and asking me about how I build models, I decided I would build and give him a model for Christmas. My wife found out the P-51 was his favorite WWII fighter and I starter looking for a suitable kit. Being a fan of the Tamiya kits I looked there first and came across the P-51D Mustang kit that comes with the staff car. The unique paint scheme with natural metal wings and front fuselage, sandwiched between a green and yellow nose and a bright yellow tail, with a plunging red arc starting behind the nose going under the canopy to land at the back of the wings contrasting the natural metal front of the fuselage with the US Olive drab covering the middle and back of the fuselage immediately captured my attention. From there the build became a number of firsts for me to experience and experiment with. The first time I used aftermarket resin parts, aftermarket decals (still not at that stage yet), first time using Alclad II for a metal finish (wow this stuff is amazing! ), dry brushing the interior, having an open canopy, documenting my progress with photos, and the list goes on. The build really took on a new level of meaning when I knew it was going to be a gift. I found that the little things I may have let slide if the build was just for me – were no longer acceptable. I have no seams from assembling the fuselage; my sanding and prep work was extensive. Even though the aftermarket Vector resin wheel wells look fantastic getting them to fit was a nightmare (I wish I had found a review on that before I bought them!?) – but the work I put in produced a result I am proud of. Most of all, I find that as I continue, my modeling skills, techniques, and attention to detail have improved more with this kit than they have in the last three I have built. The best part is that I feel I am getting to the point that I am now having my own creative ideas on how to add detail to the model because I am learning new techniques that open my eyes to the possibility of creative applications I never would have know were even possible! Most of all I am proud to know that I will be able to give this model (when it is completed) as a gift I am absolutely proud of. I am looking forward to seeing my father in law’s reaction when I give him this piece of history that I hope will remind him of our shared appreciation for the fine men and women who bravely served and sacrificed for our country to pave the path of freedom and opportunity we so abundantly enjoy today. I could go on and on, but will wrap it up there. Thanks for providing this forum Doogs! I look forward to reading through all the posts of favorite builds! Dave – love it! Tamiya’s P-51 is a solid little kit! That’s so awesome that you’re building one for your father-in-law. That’s one thing I wish I had more of – people with an interest in history to build something for! Please post a link to photos when you get it wrapped up – after this giveaway, I’m very much considering creating a page for readers’ builds. My favorite build would have to be Hasegawa’s P51D that I built just last year after many years away from the hobby. I had built two fairly inferior kits to get back into the swing of things, so this was my third attempt at creating a passible build. I also had some inspiration as it was a tribute build to my wife with fictional markings and paint representing our names, wedding date, ect. A great way to stay motivated, build a quality kit, and actually make her happy about my many hours at the bench! This little Mustang has impressed my fellow Kitmaker Networkers and earned a campaign ribbon for me on that site, the club members at my local IPMS meeting enjoyed it, and it made the reader’s gallery over on FSM’s site. So I’m pretty proud of my work. Reamon – very nice Mustang! Love the black and red scheme and the custom markings! I actually did something similar with the twin Wildcats I built last year – with markings for the kids’ initials, birthdays and so on. Sadly, the oldest is only three, so the gift is largely lost on them and the two ‘Cats currently reside with the rest of my collection. But one day I hope they find a place in their rooms. How did you find the Hasegawa kit? One thing I’ve heard is that the wing racks and specifically the anti-sway braces are a big improvement over the Tamiya kit. Heya Doogs! To be honest with you, I’e never built any Tamiya aircraft kits! Sounds crazy I guess, but I just bought my first Tamiya kit in years just this last weekend. I built several Tamiya tank kits when I was an armored crewman on M1 tanks back in the late 80’s early 90’s. I just picked up the good old Panzerkampfwagen II Ausf. F/G just to test my skill on something without wings… About 2 years ago, after deciding to get back into kit building, I first built a Revell F-4U and then a horrible Testor’s P51-D. To the absolute novice they are passible builds, but I knew I could do better. The Hasegawa kit was my next build and made it very clear to me that you get what you pay for!!! Sure I can maker a 15$ kit look fairly decent with a boatload of work and some fair amount of cursing, or I can actually pay for a quality kit and for the most part enjoy the build with some minor, nearly inaudible cajoling! I’m growing into this hobby of ours, and it was my daring interest into the insanity that is WWI rigging that lead me to you in the first place ( lovely Wingnut’s build mate! ) in the first place! So, I guess to actually answer your question, yes, I think Hasegawa makes a quality P51-D kit, and that’s why I bought 4 of them! HAHA!!! Doogs, have I told you lately that you rock? Ok, no more sucking up. My favorite build is an old Monogram F-102 I built as gift to my stock broker. He had an old photo of himself flying his 102 out of BIKF and asked me to build it for him. Since no one made his markings on a sheet I had to search around and cobble the markings from scratch. I put a lot of work into it but the look on his face made it all worthwhile. Kits and trophies may look good on your shelf but nothing beats the joy on someone’s face when you present them with something that has special meaning for them. Scott – I’m noticing a theme here of builds for others! Very cool, especially with the scratched markings. My favorite build so far has been the Tamiya Early Production Sherman. This was a recent build and my first in over 23 years. The builds before this one were at the hands of an impatient teenager without the means to build a nice model. Now that I’m older I found myself with the best tool “patience” at the bench and produced something worthy of display. Taking the time to do it well and learning a lot of new techniques along the way has been the most memorable experience ive had so far. Bob, I hear ya! It’s amazing what patience can do for one’s modeling abilities. And that Tamiya Early Sherman is a great little kit. I know Tasca, Dragon, etc bring a lot more detail and complexity, but those Tamiya Shermans are just really solid. My favorite build was a 1/48 Tamiya F4U-1 Corsair that I built for my late father-in-law as a Birthday present. He was an artist, so I thought I would pull out all the stops. It had an Aires set for the engine with the cowlings opened up/removed, a CMK cockpit set, & exposed gun bays with hatch mechanisms. It was painted & weathered to represent a PTO bird & had a custom base to display it on. When he received it there were practically tears in his eyes & he said, “this is for me?” He had it on display in his studio for several years until his passing. Looking at it now there are things that I would have done differently (better), but the look on his face was priceless. He inspected all the details & asked what type of paint I used & how I had achieved the weathering, etc. the looks on their faces & answering questions about how things were done. Mathias – that’s a great story! Thanks so much for sharing! My favorite build has been a Tamiya Spitfire mk1. I built it a couple of years ago, as part of a online group build. At the time things were not very good at home, my marriage was on the verge of ending badly. The personal stress was was mounting, and beginning to affect my work and health. The time I spent on that build gave me moments to collect my breath, reflect and meditate on the situation. It helped me to work things through; gave me something positive and constructive to work on until we could get things straightened out. Jason – man I hear you. Obviously the situation doesn’t compare, but I give Tamiya’s Spitfire Mk.VIII a lot of credit for keeping me calm, cool and collected during the layoff and unemployment this summer. Even when everything else was bonkers, it was a nice, dependable escape. My favorite build? A Monogram 1/48 F-4 Phantom. built about 15 years ago. It was my first model since high school. My wife always knew I had a interest in models, but haven’t built one in years. On one birthday, she decided this was something fun that I should get back to. I was very surprised, but then we had kids, and the time just wasn’t there. A few years later, my 3 years old finds the kit in the closet and asked me what it was. That gave me the incentive to go and build it. That finished model, with its uneven paint coverage, glue smeared canopy, silvering decals, unfilled seams, still sits on my shelf today. One day, I’m going to strip the thing and rebuilt it with my the skills I’ve learned since then. In the intervening years, I’ve built models for veterans, models that was featured in magazines, models that won awards in shows, but that gift from my wife will always be my favorite. Hello, Congratulations on your first year of this great blog. My favorite built was Dragon 1/35 3in1 Sd.kfz.251 ausf C. It was 7 or 8 years ago and first time I came across with individual links tracks. I had suspicion if I was able to build that track. Also I was very surprised with so large number of pieces. At the end everything went smoothly except a small problem with the back doors. It was a nice built. My favorite build? Ok, I am going to cheat and discuss my 2 favorite builds. Monogram 1:32 Gulfhawk – Late 60’s. This was my very first experience building a model. The significance about this is it was with my Dad. We shared the experience together: the glue, the paint and applying the decals. Will never forget the magic of the retracting wheels. Truly a Father – Son moment. BTW I do have a Gulfhawk in my stash. There were no kits of a Rufe so I took the floats from a OS2U Kingfisher and modified with putty and sanding. Using styrene sheets to make the main float attachment. Vacu-formed the canopy and scratch built the cockpit. After the paint and decals I executed my very first attempt in weathering. Thinning down washes of gray then red/brown and applied. The results were amazing. Even sent a photo to Scale Modeler Magazine. Response from SM was “thank you, does not meet our requirement at this time.” Guess a Polaroid pic was not the best way to submit a photo for magazine production. I was disappointed but not deterred. Now I am gearing up to resume (after 30 year hiatus) my first hobby in a few months (target Jan 2012) as I build up my stash, tools, paint and determine where my bench will go. This contest is awesome. Great blog too. Thank you! I think my favorite build would be the Tamiya FW-190A8 I completed in early 2010. I built models as a kid (yes they were awful) and eventually gave it up when I discovered guitar and joined rock bands. As the (many) years progressed and I essentially “retired” from a life of music I came back to the hobby in late 2007 with an Italeri BMW motorcycle. I found that it was relaxing and a good substitute to rehearsals, shows, recording records and everything that went along with being a “band guy”. When my wife got pregnant with twins in early 2009 i kept on building kits realizing that my time was limited once the little ladies arrived. I had the Eduard FW 190 A8 kit and had started on it only to find that I had glued the cowl slightly askew and it basically ruined the fit for me. Now I would just saw it into pieces and rebuild it but at the time I hadn’t quite hit that skill level yet. Frustrated because I loved the decals AND had purchased aftermarket gun barrels, I turned to the Hasegawa 190. That kit was sub par in detail and fit. Finally I gave up and threw down the cash for the Tamiya 1/48 FW 190 A8. The fit was superb and I finally had the kit up and running. Fast forward months to January 2010 and my daughters we’re born. I was on that final stage of weathering the 190 but tossed it aside to attend to my wife. Out of 5 nights in the hospital I went home once to take care of the cat AND finish the last little bits on the model. I was very proud that I had completed it before the girls came home and so put that project on the “finished” list. Since then, I have had very little time to build, actually only completed four kits in nearly two years, but that loss of building has been overshadowed by my amazing daughters. They have since come to really enjoy aircraft (or “airpanes!” as they call them) so I have been building up 1/72 scales WWII fighters to hang on their bedroom ceiling, practicing new techniques and generally enjoying the process again for their entertainment. The Tamiya FW 190 represents my last kit before being a dad so holds a special place for me. Guys…these are fantastic! I won’t lie, it’s been a rough couple of days around here, with the move, daughter getting sick (including a stay at the hospital Sunday night), all the way down to stupid, annoying little things like my parking garage card not working this morning (one more thing to deal with!). I’ve been in a pretty dark mood and missing my bench time something fierce, but these accounts have completely turned my day around! I want to come back and reply to them individually, but for now, keep ’em coming! Wow, what a generous contest to go along with your most interesting website. I found voting on these kits a very tough decision. You made them all sound so awesome. I love the whole journey verses destination kit idea. I built a Tamiya Cromwell at the end of last year and enjoyed it so much. This was the first kit I used a resin Verlinden update kit on. I never worked with resin and was afrad of it, but truelly liked the details you can get with it. I also used a lot more photo-etched on this tank. For the painting, I tried the black post-shading and faded pre-shading with very good results. I got myself a oil paint set and used this extensively on the figure and weathering the tank. So I think it all boils down to being my favorite, because I tried some new products and techniques with good success. But, most importantly, it was fun to build. Favorite Build: 1/72 Erii Japanese Type A Midget Submarine. I was able to land the kit while on a business trip to Japan. A colleague of mine sent his assistant all over Tokyo to locate the kit and have it waiting at my hotel when we had finished our day working. I’m forever grateful for the simple gesture after mentioning that I would like to visit some hobby shops in the area to try to locate one (soon after, FineMolds began to distribute the kit). Even though I had a large stash of kits awaiting my attention, I immediate put this at the front of the queue. I was a nice deviation from the typical 1/48 aircraft that usually occupy my workspace. It was one of my favorite given the nature on how I obtained the kit. I’m 38 and haven’t finished a kit since I was about 12. I’ve tried 2 recently and have wrecked them trying to make them perfect. One shouldn’t jump right into the advanced techniques without working up to it. Still getting back into it…time permitting. My favorite build was a P-61 ( I was 12 ) that my grandfather bought me for X-mas. He was a WWII B-17 pilot. He knew I was into models but always bought me airliners or space shuttles for gifts. 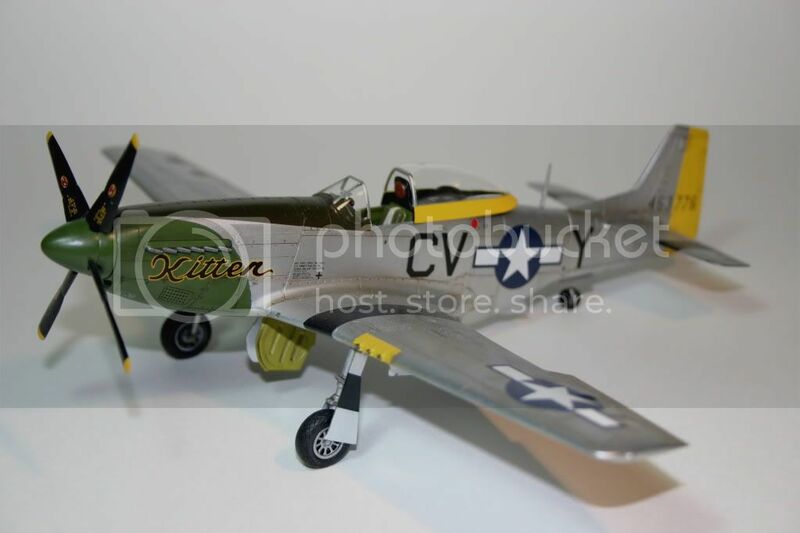 Towards the end of my modelling days as a child he got me the P-61. I spent the extra time and it turned out to be far and above the best I had done. Black spray for the body and everything else was hand painted, including the interior which you couldn’t really see. I still remember how well it turned out and how pleased I was. I am still getting back into the hobby and have become enthralled with the on-line community. The quality of the builds and knowledge available on-line is amazing. It’s awesome to see how many, like myself, are getting back into modelling after such a long hiatus. I follow your blog or check out the other sites almost daily. Too much reading and not enough building though. Here’s my vote the Jug. One of my favorite planes as well. 8x 50. cal and built like a tank. Send it my way and I’ll give it the time and care it needs and will post some pics of the results. Cheers and keep this site going! Having just got back into the hobby in Feb of this year (which means I’ve only 8 kits to go by) after a 35+ year hiatus, my favorite kit thus far would be the……. Tamiya A6M2 type 21 Zero. I suppose it’s because it was the easiest, being a so-called “shake & bake” and a fun subject to boot. Not that kit building should be “easy” but it does allow you to enjoy the project more. I found that the frustration level was mitigated by excellent fit, great detail and all at a VERY reasonable price! I have learned so much about this hobby since returning to it by frequenting web-sites and blogs such as your’s. The information and help available at my finger tips (something unheard of 35 years ago) is just amazing. I hope to continue to meet fellow modelers, best wishes for you and thanks again Doogs. Love your blog, Doog, and this competition is pretty special. I seem to be part of an incoming tide of returning modelers, as I am also returning to the hobby after many years. At the moment, am building a 1/35 T34-85 which am having a ball with doing (thank goodness for the web so I might learn enough as I go to not butcher it with my love). But I can hardly include it here as it is not finished! So I have to go back into the mists of time when I was making 1/72 AFVs for my wargaming pursuits, and I still remember one model in particular, an Airfix Chaffee. It was the last model I made in those days, and was the one where I finally ‘cracked’ a few of the secrets of neat lines and smooth paint jobs, even experimented a bit with weathering. It was I fitted out an interior for when it would get ‘brewed up’ on the table, and put it into a scratch built diorama on my shelf when it wasn’t on active service. It turned up recently in an old box, carried with it quite a buzz from wonderful times. And I’m loving my return to the hobby! I first have to say that I love the blog Doog. It has been an inspiration. I also have returned to the hobby after a many year break. I first started building models when I was around 10 or so. It was a fun activity that my dad shared with me. He would build railroad models as I would build airplanes. It gave us something fun to do together and a wonderful way to connect. Now that my wife and I have a newborn, I am looking forward to sharing my hobby with him when he is older. One of my most memorable builds would have to be from my younger days. It was a testors SR-71. What made it alot of fun was I was building it during the first time they took the plane out of service. I grew up in Ohio, not far from Wright Pat Air Force Base. When they took the 71 out of service they were going to put one at the museum at Wright Pat. It was scheduled to land at a public ceremony. Myself and dad skipped work and school to go watch. It was a great day spent with my dad and I also got some great pics (well dad did) that I used as research material for the model. Like many hobbies, it is not the finished product that is memorable, but the journey. While my dad is still around, it is those memories of building models and spending time with him that I treasure most. Doog, thanks for the great site, and I look forward to many more posts and tips and general neat info. I have enjoyed your blog almost since it began as it coincided with my return to modelling. Like many before me, my favourite build has been a Tamiya P51. Here on Cyprus we can only get Revell models so it came as a very pleasant surprise when my wife returned from a visit to Poland with the kit in her luggage. What impressed me particularly was the excellence of the engineering and the perfect fit of the parts when compared to the Revell counterpart. The fact that I almost ruined the model attempting to airbrush an all metal finish is beside the point. The build gave me hours of pleasure and I can only hope that one day Tamiya appoint a Cyprus distributor. Keep up the good work and I hope the move goes smoothly. I found out about this give away from my brother who has previously posted a comment. In it he talked about how he is currently building a P51 Mustang for his father in law. He is actually the person who got me into building model airplanes. For me I would have to say that my most favorite build I have done so far is the only one that I have completed. I recently finished a German WWII Stuka Ju87B2 Hasegawa kit. Like my brother my favorite models to build are WWII fighters. I built it late spring early summer at my brothers’ place. I would work on it a few times a week. I didn’t have too much time to work on it due to the fact that I had a lot of stuff going on with school and work, but I really enjoyed the process and enjoyed the time I had to get away and relax by building this model. My brother helped me a lot in the process showing me a few tricks that he learned from this blog that had helped him a lot on his previous builds. I found it to be an extremely fun process and really enjoyed being able to create something that I am very proud of. I was amazed to see just how well a plain can turn out with a few helpful tips and when you take your time trying to do the very best you can and to continue to improve what you are doing. I am still in the process of learning how to do things and trying to improve my skills in building these kits, and it has been a very fun learning process that I will continue doing for a long time to come. It’s been a long time sense anything has bitten me this hard and I find myself sitting looking at it from time to time, amazed how well it came out and how great a looking space fighter it is. Favorite build of all time was my Hasegawa 1/32 P-51D. Now before you start trowing tomatoes let me explain..!! Built in 2009 this kit was my first 1/32 and i decided to build it BMF(Old Crow). The fit was great and detail good enough for me. It took me 9 months to build this kit and it was really fun. I fell in love with foiling and ever since wanted to get back and foil a second kit witch i finally started this year (1/48 b-25). As for the result it is still to this day the kit that everyone that come in my office looks at. Shes no where near perfect but she does attract attention. She will be donated this year to one of my good friends that simply loves it and must go take a look at her every time hes in my house. Nice touch, great idea and congrats on the first anniversary! My favorite build was a 1/35 Tamiya Mid Production Tiger I that I did for the 1996 IPMS Nationals held in Virginia Beach that year. First time I had ever competed at the national level and first time I had ever been to Virginia Beach. I scratched MOST of the interior using various references I acquired for the project. Labor intenstive but most rewarding and even though it didn’t place, it still holds the high spot in my modeling experience. My stepson won 3rd place for his 1/6 Boba Fett in the Junior category that year. I think he still has it someplace…. I was 10 years old (OMG..that was 30 years ago !!! ) when i saw a box with a picture of a plane on it in local shop at my town. It was Esci A-4E Navy Skyhawk in 1:72. It also had a bottle of glue with it. I still rememver the thrill of collecting money to get it. Than it came that day, it was mine …finaly. So i come home opend the box and look all that tiny parts stunned. I asure u all it was build in less than few hours, without any paint on it and just with decals, no sanding no putty on it but when i finished it it was perfect.Since than i built many models but that Skyhawk is my favorite. I got the same kit last year on net and i will build it again this time by the rules loool. Anyway, I don’t have many completed builds that qualify as built to the standards we recognize regarding basic construction and finishing. My choice comes from those, and it’s Dragon’s 1/35 M2 halftrack. I don’t complete many models because part of the fun for me is adding detail and making a kit more accurate. I’d heard about the old Tamiya M2/M3 offerings but decided to spend my dollars elsewhere. When Dragin announced the M2 release, I read a couple reviews and jumped. I was wowed: the level of detail and the engineering were fantastic. Now, this from someone who has a lot of older kits in his stash that have or will have at least a few scratchbuild goodies added. Mind you, the Dragon offering isn’t perfect, but I decided to give myself a break and build it OOB. Totally glad I did. I’m equally happy with the outcome and that I actually added a finished kit to my shelf, but Dragon’s attention to engineering and detail is what sold me on their brand. I was surprised to notice a couple boo-boos in the instructions given the attention to what else is in the box, but after having read more about this phenomenon I took my grain of salt and moved on. It’s been two years since the build, but I still love looking at it on the shelf. I’d have to say my all time favorite was the 1:32 Hasegawa “High Tech” FW 190D-9, mostly because I finished it. Kit was about high tech as a hammer, but with a lot of patience, some bad words (I think I even invented some new ones), and tenacity, I was able to finish it to a standard that I have yet to surpass. My favorite build was a Tamiya 1/48 P-51d that I built about a year and half ago. Yes that’s recent as I had a return to the hobby as well. My great uncle flew the P-51 over Europe with the 359th FG and I have always dreamed of building his plane. The daunting task would be the decals. I had a rough understanding that one can make decals, but that seemed far off in terms of my skill. I spent a lot of time doing google searches, hoping to find decals to make it happen. I had given up when I came across the exact decals for his plane! Not sure how I missed it, but Aeromaster/eagle strike’s Green Nose Mustangs (part 5 or 6) has his exact plane. I was so pumped I ordered them that minute. I was so excited that I must have written all the guys on my forum about my good news. Their response was great. In fact, I had someone donate a Tamiya Mustang kit for the build. I was so humbled and grateful to be building my great uncle’s Mustang. Best of all, he is still alive to this day and I was going to get to show him my build. This Mustang was the first model I used an airbrush on, and I was so much fun. I practiced a lot before I hit the model with any paint. The build, being a Tamiya Mustang, went smoothly until I got to the sloped curve of the green nose section on the 359th Mustangs. I finally got the curve right with a patter and masking tape. It came out wonderful. I took the model up to Chattanooga to show my great uncle and he loved it. His memory, short term especially, suffers greatly. Yet that Mustang grabbed his attention immediatly. He knew right away what that model was. He exclaimed that it looked just right. What a moment. It didn’t matter how many seams were showing or if the gear was perfectly straight. It didn’t matter if I had used the correct shade of Interior Green or not. To see my great uncle enjoying the model of his plane was priceless. As we approach Veteran’s day, I want to give a big thank you to my great uncle and his brother, my grandfater, who fought in WWII. They have been and are still to this day, great men and solid examples. I plan to call them Friday and remind them what their service means to me. Okay all – the giveaway is officially closed! I still want to come back and respond to comments as time permits, but thank you all so much for participating! With the bench out of action at the moment, this has been a wonderful distraction. As of this writing, the winners have been tabulated and the first has been notified. Once they pick between aircraft and armor, the second will be notified, and then I’ll announce who the two lucky ones are! Thanks again – it’s been fun. I’ll definitely be doing this again next year! My favorite build was one I did a number of years ago: a plank on frame model of the HMS Beagle. I had always waned to tackle one of the old sailing ships but shied away from doing so due to the inherent complexities involved (bending and shaping the planks to the right shape, gluing the planks in place, making sure the planks joined at a frame, Holding the planks in place with pins, rigging the cannons, rigging the ship in general, etc.). Nothing is just glue number x to the deck, it was build everything from the raw wood that was included in the kit. What finally got me moving forward on the project was finding a mentor who had built numerous such ships. When we moved to Burlington, Ontario from San Francisco, turns out friends of my wife’s parents lived in Toronto. He was retired in his late sixties and repaired and built wooden ships. When we first met, he took me down into his workshop and showed me some short cuts to move such a build along more efficiently. And each time we got together, I learned more and more. Taking those tips, I finally undertook the build and though it took over a year to finish due to my travel schedule,I was pleased with the results. Some of the tricks I learned were using black markers on the edge of planks to give the appearance of the tar used to seal them, how to make the fife rails more realistic by wrapping line around them, how to rig the ratlines by knotting the horizontal lines to each of the vertical lines (a very slow process but the effect is incredible! ), and how to detail the spars among many others. The rigging was a slow task but again, the final product was very eye catching. My mentor and friend is 90 now and no longer builds ships as the business dried up. We do continue to visit him over the holidays. Because of the mentoring and friendship that developed due to our common interest, I look at this as my favorite and most memorable build.